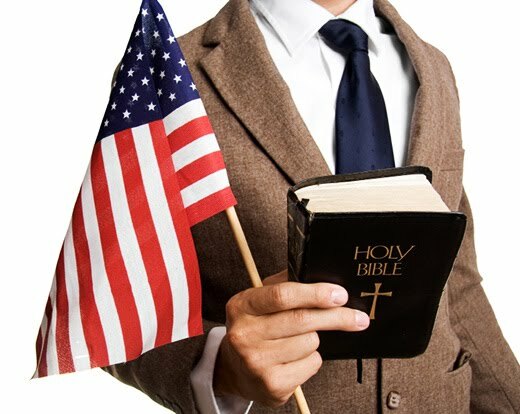 America Revealed: Welcome to the "Christian Nation"
Welcome to the "Christian Nation"
The "Christian Nation" folks, led by David Barton and Phyllis Schlafley among others, are once again in full stride with the GOP takeover of the House of Representatives plus a number of State Houses and state governorships. You know the drill. They claim that the "Founding Fathers" were really "Christians" who wanted to set up a "Christian Nation," that the intent to do so can be found in the Declaration of Independence and, if you read it really, really carefully, the Constitution, and anyway, it would be a really good idea. Our side usually responds by, for example, pointing out one or more of the following. Most of the Founding Fathers were deists if not outright atheists. The word "god" does appear once in the Declaration, but the key word in the central "endowment" clause is "creator," not "God." As a humanist, I interpret "creator" to mean the natural laws of physics, chemistry, and biology which have created all that is in the total universe. Of course even the word "god" does not specify the Christian one. It could be the Jewish one, the Muslim one (and both of those religions claim to worship the "one true god"), or Zeus or Ra for all we know. Then there is the provision of the Constitution's Article Five, prohibiting religious tests for government office, and the establishment clause of the First Amendment, to say nothing of the fact that neither the word "god" nor the word "Christian" appear in the Constitution. And then there is the famous Article 11 of the 1797 Treaty with (Muslim) Tripoli, concluded during the Presidency of John Adams, himself a Founding Father, in which it is clearly stated that the U.S. is not a Christian Nation, to wit: "As the Government of the United States of America is not, in any sense, founded on the Christian religion, --- as it has in itself no character of enmity against the laws, religion, or tranquility, of Mussulmen, --- and as the said States never entered into any war or act of hostility against any Mahometan nation, it is declared by the parties that no pretext arising from religious opinions shall ever produce an interruption of the harmony existing between the two countries." Ah but be that all that above may be, the promoters of the "Christian Nation" (C.N.) doctrine keep at it, the facts of history to the contrary notwithstanding (but facts don't seem to bother those on the GOP/Religious Right much anyway). So I thought in the alternative in dealing with the matter that it might be useful to see just what a "Christian" United States would look like, according to those who promote the doctrine themselves. Since one will never win an argument with those who circulate in an alternate reality, it might be useful for our side to show the folks whose minds are not made up on the matter just what those whose minds are made up, on the C.N. side, have in mind. Well let's see. Barry Lynn, Executive Director of Americans United for the Separation of Church and State, in a letter of January, 2011, based on events that have already taken place in various parts of the country, tells us that in a "Christian nation" creationism would promoted in the public schools, clergy would be invited into classrooms to lead students in prayer (presumably Christian, of course), crosses could be found hanging in gymnasiums (one was found in at least one such place), and forced prayer would find a place in schools along with Bible classes. It would include putting the Ten Commandments up on any public site they could think of, even though that's the original document on which Judaism was founded, but what the hey. Consistency is the hobgoblin of small minds, isn't it? Of course abortion at any stage of pregnancy for any reason would be banned by Constitutional Amendment. At base, abortion rights come down to the matter of the religious belief as to when life begins. Even though there are plenty of Christians who believe that it begins at the time of viability, the C.N. folks, who hold to the religious belief that it begins at the moment of conception, would criminalize everyone else's religious belief. Of course they would ban gay marriage. That violates the equal protection clause of the 14th Amendment but while they are at it the C.N. folks would like to repeal that one anyway. If Jim DeMint had anything to say about it, gay teachers would be banned from the classroom (DADT in Schools, anyone? ), and if they were banned there, where else might they be banned? In the Senate perhaps? (Actually, the GOP would likely not go that far; it would reduce their representation there significantly.) Then there are the matters of the use of contraception at one end of life and end-of-life decision-making at the other (Jeb Bush, the next GOP nominee for President, and his signature Schiavo case, anyone?) Talk about Big Government. The C.N. folks are for that foursquare when it comes to matters of religion. But going beyond what they tell us they would have the nation look like, what else might it look like that they don't tell us about. First and foremost, whose "Christian" are we talking about? Is it the trinity Christians or the unity Christians or the Christians who sort of by-pass that one. Is it those Christians who believe that wine and wafer truly are the blood and body of Christ or those who think that that is nonsense? Is it those who believe that baptism is necessary for "real Christians" or those who don't, and for the former, is it a symbolic few drops of water (holy or not) or a full-fledged dunking? Is it those Christians who hold that the clergy should be celibate or those who don't? Is it those Christians who believe in a set of "Latter-Day Saints" or those who say that the former aren't Christian? Is it those Christians who believe in Original Sin or those who don't believe in the concept of "sin" at all? Is it those Christians who believe the King James Bible English translation of a Latin translation of a Greek translation of an Aramaic/Hebrew original text is "inerrant" or those who don't? If it is the former, there are passages of, say, Numbers or Deuteronomy or Leviticus that sound an awful like about the much-feared Sharia Law to me. Then, if the United States is a Christian Nation, with, one would think, special rights granted to Christians, who decides who is and who isn't, and what then happens to all of the rest of us Jews, Muslims, Humanists, Atheists, Deists, Hindus, pagans, Buddhists, and etc.? Interestingly enough, one Queen Elizabeth II of the United Kingdom, who just happens to be the Head of the Church of England, the longest existing unified Christian church in the world other than the Catholic one, had this to say to its recent General Synod (BBC News, 11-23-2010, quoted in Freethought Today, Dec., 2010): "In our more diverse and secular society, the place of religion has come to be a matter of lively discussion. It is rightly acknowledged that people of faith have no monopoly of virtue and that the well-being and prosperity of the nation depend on the contribution of individuals and groups of all faiths and of none." Presumably, the Head of the Christian Church or churches in a "Christian United States" would have none of that. Finally, there are indeed numerous Christian denominations in the United States, each of which apparently believes that it is the "true Christian Church." Among them are those Christians who believe that differences among them can be settled at some latter day ecumenical council. On the other hand, there are those, and they are certainly not just Catholics (and not all Catholics would go for this process), who would have a version of the Catholic Council of Trent (1545-63) which defined the "true faith" and led in part to the horrific religious wars that consumed Europe for the better part of the next century. One must wonder who would command the pulpit at the National Cathedral in Washington, DC, which would presumably become the Central Church for a Christian United States, making such decisions. In addition to making the historical arguments which cannot be countered except by those who believe in an alternate reality, let's start raising these issues before it is too late to raise them. On this date in 1600, Giordano Bruno (née Filippo Bruno) was executed for heresy. The Italian philosopher was burned alive at the stake at age 52 for refusing to recant heretical ideas. Born Filippo Bruno in 1548, he entered the Dominican Order at Naples at age 15, adopting the name of Giordano. After being accused of heresy, he fled his Italian convent and traveled throughout Europe (1576 to 1592). During two years in England, Bruno wrote and published six dialogs, including "On the Infinite, the Universe, and Worlds" and "The Ash Wednesday Supper." A Copernican , he rejected Aristotelian dogma and challenged entrenched religious teachings, declaring pantheist views. Some academics today regard him as a path-blazing intellectual, others as a victim of his nonconformity. When Bruno returned to Italy in 1592, he was arrested by the Inquisition. Bruno was imprisoned for seven years in the dungeons of Rome, where he was tortured and isolated before being executed. Bruno was just one of the more visible martyrs and victims of church persecution. Anonymous are the tens of thousands, if not millions, of women put to death as "witches." Known to us are such martyrs as Vanini, a monk burned as an atheist in 1619; Servetus , a Spanish physician executed under Calvin's orders in 1553 for rejecting the trinity; Scottish student Thomas Aikenhead, hanged in 1697 for saying Christ was merely human; and those persecuted in the New World. Roger Williams and Anne Hutchinson were banished for advocating religious tolerance. Quaker Mary Dyer was executed for heresy in Boston. A statue to Bruno was erected at the site of his execution, Campo dei Fiori near the Vatican, on June 9, 1889, by "Freethinkers of the World." On that date, Algernon Swinburne dedicated a poem to Bruno. D. 1600. "A sacrifice to hate and hell . . . "
Welcome to Debtors' Prison, 2011 Edition . Defunding Public Media: Disaster Or Opportunity? U.S. Dollar Devaluation and the I.M.F. War as Big Business & the N.W.O. Westboro Baptist Church: A sign of the times? The dreams we leave behind for our children. A National ID Card For American Citizens?